GATHERING OF GIVERS. Members of the 100+ Women Who Care chapter in Madison gather for a meeting. A chapter of the international philanthropic organization is forming in the Chippewa Valley. 100 Women Who Care, a national giving organization with hundreds of chapters, will launch an Eau Claire Chapter on May 8. 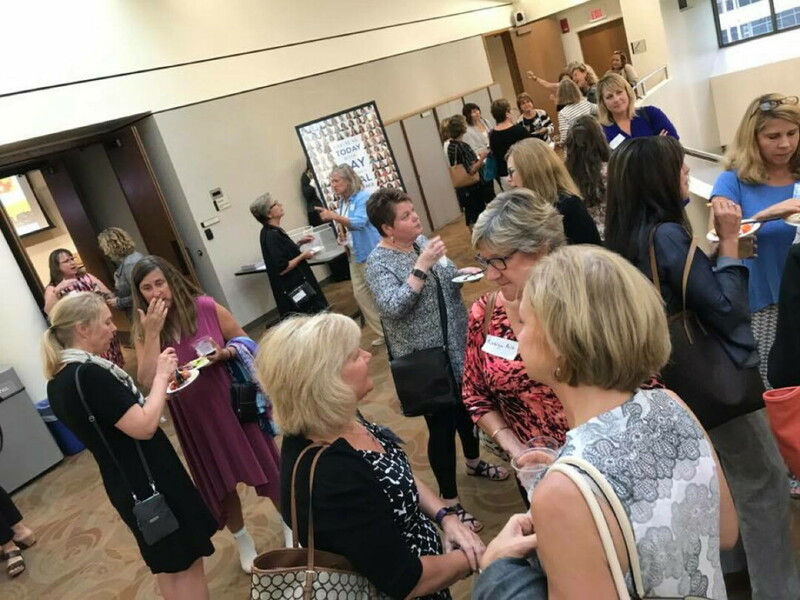 “100 Women Who Care was originally started in 2006 by a group of women in Jackson, Michigan, as a brilliantly simple way to raise money efficiently and quickly for local charities,” said Pam Haller, one of the women working to launch the local chapter. The first event was to raise money for cribs for women whose newborn babies were at risk from not having a safe place to sleep. Since then, the organization has continued to grow, launching over 550 chapters of 100 Men, Kids, People, and Women Who Care all over North America and the world. The concept is that 100 women (or individuals) gather quarterly, with each giving $100 per meeting to a local nonprofit democratically selected by the group. Three nonprofits will make presentations at each one-hour meeting. The women then vote for one of the nonprofits, and the winner will receive $10,000 in direct donations that evening or shortly thereafter. Even if they do not win the vote and the donations of the 100 Women, all of the organizations receive exposure to philanthropic women in the community. In total, $40,000 in donations will be made by the group annually. The Chippewa Valley group is being launched by 10 local women: Pam Haller, Ann Nelson, Sara Pertz, Anna Sizer, Lauren Sullivan, Kari Tatu, Colleen Weber, Kendra Weber, Melissa Wilson, and Kathy Wright. The women joined forces about six months ago and started to plan a chapter in Eau Claire, inspired by other successful chapters throughout North America. “The goal was that these 10 women would come together with other interested woman to bring awareness to the great work that our local nonprofits are doing and to support them financially,” Haller said. The group has already recruited 100 members but is open to including more. The first meeting in Eau Claire will take place at 5:30pm, May 8, at the SideBar next to the Court’n House, 113 W. Grand Ave. Beacon House/Family Promise of the Chippewa Valley, Boys and Girls Club, and The Community Table will each give a five-minute presentation on why they need the groups’ financial help to succeed. They will take questions following the presentation. Members will cast individual ballots for one of the three charities to receive the collective donation, and the majority will rule: Each member must donate to whichever charity wins whether or not it was the charity she voted for. The entire presentation, tallying, and donation process will take place in an hour. All donations will be given to charities or causes with 501(c)(3) status serving Eau Claire, Chippewa or Dunn counties. No national charities will be considered, although local branches of national charities are eligible. Members may nominate as many of their favorite local charities as they wish. Once eligibility is confirmed by the 100 Women Who Care Board of Directors, members decide which three charities will present by majority vote. To learn how to join or to find the charitable organization form, go to 100womeneauclaire.org or facebook.com/100womeneauclaire.